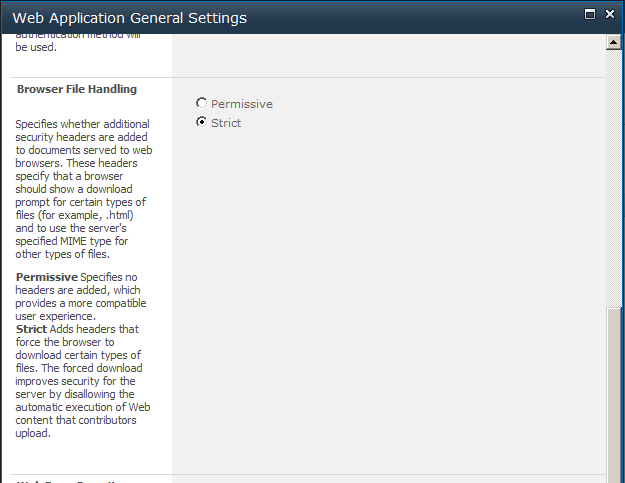 Out of the box, SharePoint 2010 has it’s browser file handling level set to strict. Strict mode adds headers that force the browser to download certain types of files. The forced download improves security for the server by disallowing the automatic execution of Web content that contributors upload. 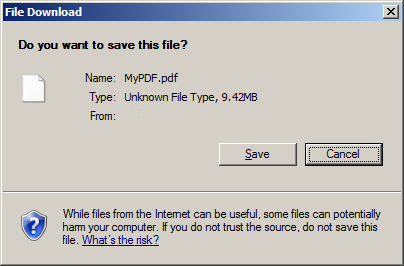 If you try to open a file that is in the restricted list of file formats, pdf or xml for example, you get prompted to save or open the file. The browser does not handle the loading of that file using your default preferences. In most cases there are only a few file types that you would prefer not be prompted, but you want to keep the strict browser file handling security feature of SharePoint 2010. $webappurl = Read-Host "Enter Web Application URL"
Write-Host "application/pdf, text/html, text/xml, application/x-shockwave-flash"
$mimetype = Read-Host "Enter a mime type:"
Write-Host -ForegroundColor Green "MIME type is already added." This powershell script can be downloaded here. If you need a reference to other mime types to add, Wikipedia has a good list in this article. Thanks for visiting. Hope this helps.